When making any marijuana receipt it is important to understand the process of Decarboxylation. When marijuana is consumed raw, the THC is not released. THC in this inactive state is known as THCa. The process of heating THCa means that it becomes Decarboxylated and is released in the form of THC. It is always better to Decarboxylate marijuana before making your edible. It is an easy process. First break up all the cannabis flowers and buds into small pieces. Next, preheat the oven to 240° F. / 115° C.Put the pieces in one layer on a rimmed baking sheet. Bake for 30-40 minutes and turn and stir the marijuana pieces so that they are all even. The marijuana has now been Decarboxylated, and you will have to do this for nearly every marijuana recipe if you are not using medicated marijuana oil or medicated marijuana butter bought from a store or online. After the marijuana has been Decarboxylated the next step is usually to grind it up so it is ready for cooking in a recipe. 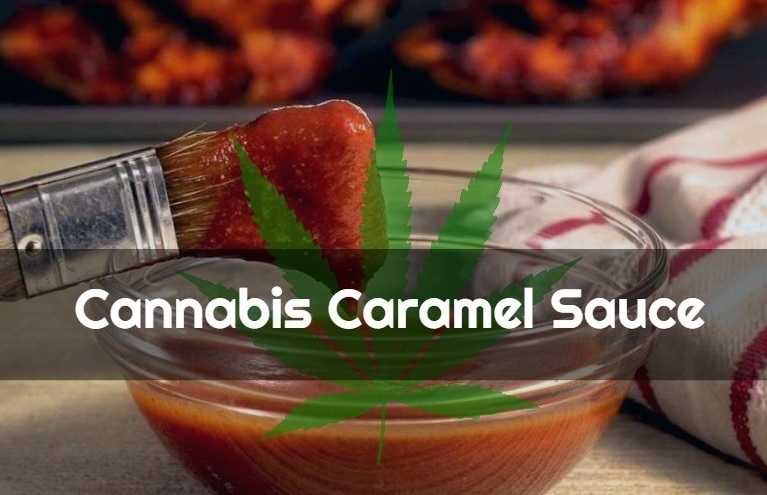 Cannabis caramel sauce can be a great addition to any desert or any food type. For those who don’t like to smoke their marijuana, there are many other ways to get the benefits of CBD and THC. And as an added bonus you get to fill up your stomach with a great tasting treat. Cannabis caramel sauce has many applications and is very easy to make. There are many different ways to make cannabis caramel sauce but the following is one of the most straightforward. First measure out 3 grams of the decarboxylated marijuana. If you are using hash or keif 2 grams should suffice. Use a grinder, food processor or coffee grinder to grind up the weed. The more finely ground the weed, the better, in nearly all instances. Now start to heat the condensed milk using the double boiler. Reduce the heat of the boiler to low after it starts to boil. Slowly add the finely ground marijuana to the condensed milk and gently whisk the mixture. Put a lid on top of the mixture and let it simmer for 90 minutes. The mixture will get darker and thicker over time. Check on it and stir occasionally. Do not let the mixture heat to more than 170 degrees (use a thermometer). Depending on what you eat it with and how you prefer the taste and thickness you can make it thicker and darker as you wish. You can also adjust the length of cooking time and the amount of marijuana/hash/keif. The longer it cooks the darker and thicker the mixture is going to get. The most important thing is not to overheat the mixture. Once the mixture is dark and thick you can whisk it to make it as smooth as you want. The recipe is very easy to make and is a great entry into the world of marijuana edibles. And because cannabis caramel sauce is so versatile it can be used in a variety of different dishes, though desserts such as ice cream are ideal.